Here’s the first little something from the dusty 70s books: a firm izakaya favourite, agedashi tofu. ‘Izakayas’ are usually loosely translated to ‘taverns’ (presumably by Americans who don’t know what ‘pubs’ are), but since no-one’s seen a tavern since Dickens shuffled off this mortal coil, it’s not really the best equivalent, but there basically isn’t one. Izakayas are where you often head with your workmates at the end of a long day for a few icy glasses of frothy beer, accompanied by plenty of small dishes and maybe a few plates of noodles – a kind of Japanese tapas bar. As someone who feels the impact of even one pint during a meal-less after-work drinking session, I’m very tempted to start my own in London. So, amongst small plates such as yakitori and onigiri is agedashi tofu – lightly fried tofu bathed in a dashi-based sauce whilst still hot. It’s simple and delicious and makes a great part of most Japanese home cooking. 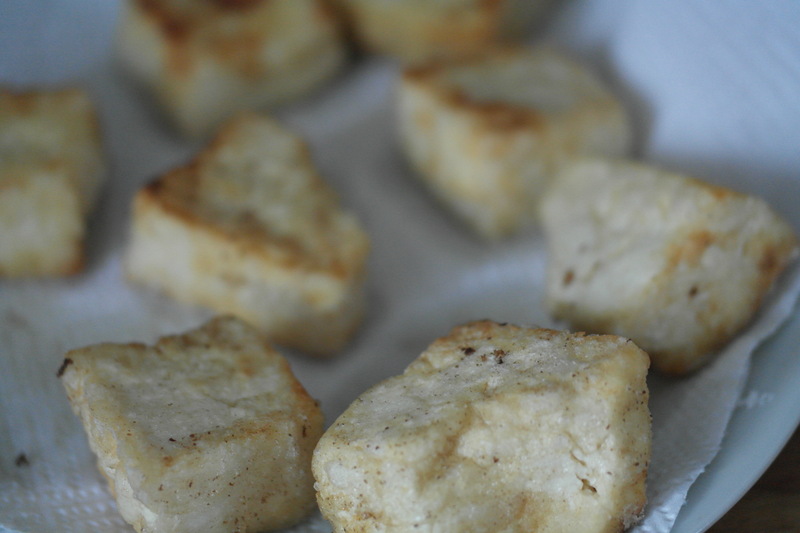 For this one, it’s important to use rougher tofu as the porousness allows the tofu to soak up the flavour of the sauce. And it’s cheaper. Bonus. First, make the sauce – add the dashi, soy sauce, mirin and sugar to pan and heat. Turn off as it comes to the boil and set aside. Sandwich between kitchen paper on a plate, and stick another plate on top so that the moisture drains out – replace kitchen paper a couple of times over 20 minutes.